MARY KATHERINE SPERBECK (Nee Anderson) of Marlton, NJ, passed away peacefully, surrounded by loving family on Wednesday, January 16th, 2019, at the age of 95. Born in Marlton, NJ, she is the daughter of the late John and Katherine Anderson (Nee Watson). 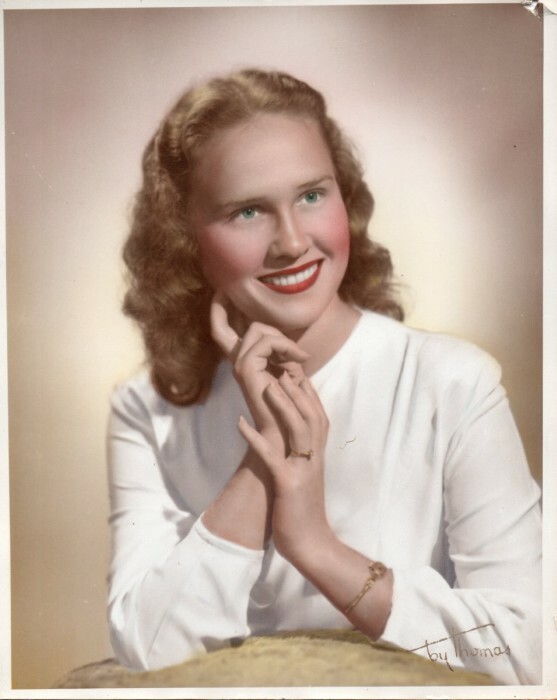 She attended Marlton public schools and graduated from Haddonfield High School in 1941. She attended Melton School of Business in Moorestown, before working at RCA in Camden, NJ. Later, “Kathy” worked for Curtis Publishing Company in Philadelphia, PA. She married her beloved husband, the late Charles Norman Sperbeck Sr., in 1949, and became the devoted mother and homemaker to her 4 children: the late Charles Norman Sperbeck Jr., Randy Sperbeck, Kristy Cusick and her husband Garry, and Darla Bush and her husband Chuck. Kathy was a poetess, writing beautiful poems throughout her life. She was an active member of the Easton Bible Church, volunteering as a Pioneer Girl Leader and serving for various functions in the church. She was also a member of the Evesham Township (Marlton) Historical Society through the years. She supported many charitable organizations such as Am Vets, Voice of China and Asia, Voice of the Martyrs and Food for the Poor. Kathy was the caring grandmother of Charles Norman Sperbeck III (Nicole), Matthew Cusick (Ambyr), Jennifer Cusick-Loss (Brian) and Katie Lynn Bush (Daniel). She is the Beloved Great-Grandmother of Charles Norman Sperbeck IV, Wade Cusick, Olivia Cusick and the late Julie Lynn Merkl. Relatives and Friends are invited to her viewing on Monday, January 21st from 10:00 -10:45 AM at the Easton Bible Church, 2407 Fostertown Rd., Hainesport, NJ, 08036. A funeral service will be held on Monday at 11:00 AM. Interment will follow at the Easton Bible Church Cemetery, Hainesport, NJ. In lieu of other expressions of sympathy, donations may be made to the Ramiah Ministries, C/O Fellowship Baptist Church, 22 Zulker Ave, West Berlin, NJ, 08091, or to The Easton Bible Church, 2407 Fostertown Rd., Hainesport, NJ, 08036. (www.BradleyStow.com).